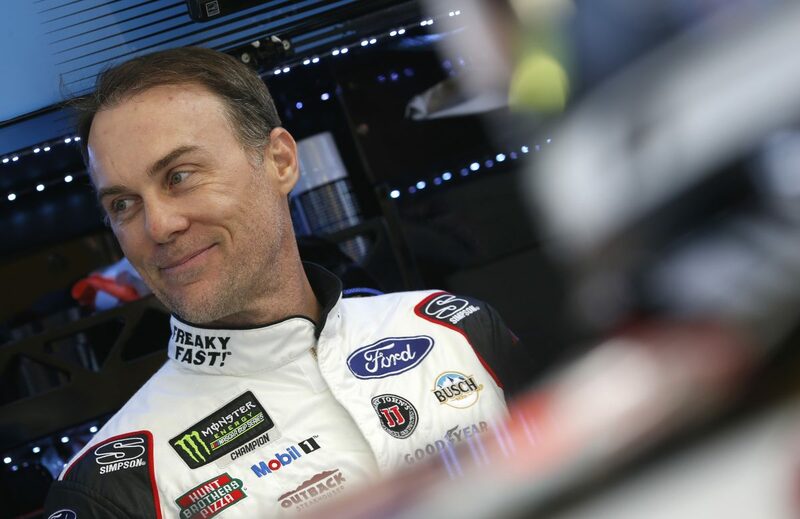 Kevin Harvick is going for his third consecutive Monster Energy NASCAR Cup Series win this weekend as the series heads to ISM Raceway near Phoenix for Sunday afternoon’s TicketGuardian 500k. The driver of the No. 4 Jimmy John’s Ford Fusion for Stewart-Haas Racing (SHR) is off to a “Freaky Fast” start to the 2018 season, having scored back-to-back Cup Series wins at Atlanta Motor Speedway and Las Vegas Motor Speedway. He’s been so fast that he has led more than 49 percent of the total laps run in regular-season points-paying events thus far. Last weekend at Las Vegas, Harvick scored a perfect 150.0 driver rating, starting second, leading 214 of 267 laps and finishing 2.906 seconds ahead of runner-up Kyle Busch. The last Cup Series driver to win three consecutive races was Joey Logano, who won three October races in a row during the 2015 NASCAR playoffs at Charlotte Motor Speedway, Kansas Speedway in Kansas City and Talladega (Ala.) Speedway. While Harvick has racked up 39 wins in his Cup Series career, he has never won three Cup Series races consecutively. Logano is one of only three active Cup Series drivers to have ever accomplished the feat. The others are Kyle Busch, who won at Kentucky Speedway in Sparta, New Hampshire Motor Speedway in Loudon and Indianapolis Motor Speedway in July 2015, and Jimmie Johnson, who has done it twice. Johnson’s first three-race streak came at Charlotte, Martinsville (Va.) Speedway and Atlanta in 2004. Johnson also has the longest win streak among active drivers when he won four in a row at Martinsville, Atlanta, Texas Motor Speedway in Fort Worth and Phoenix in 2007. If history is any indication, ISM Raceway could very well be the place Harvick joins that elite list. Harvick’s career numbers at Phoenix feature a series-high eight NASCAR Cup Series wins, including five in his last nine outings. He became the only Cup Series driver to win four consecutive races at the track when he won the November 2013 race, swept the 2014 races and won again in March 2015. Only five drivers have won consecutive Cup Series races at Phoenix and Harvick is the only one to win consecutive races twice. He swept both races in 2006 to go with his back-to-back wins in 2014. His most recent Phoenix win was last March. According to NASCAR loop data, Harvick is the only driver to score a perfect 150.0 driver rating on three different occasions at Phoenix. Harvick scored his first perfect rating at the mile oval in November 2006, when he started second and led 252 of 312 laps on his way to victory lane. He accomplished the feat a second time in winning the November 2014 race. His third perfect score came in March 2015, when he won the pole, led 224 of 312 laps and beat Jamie McMurray to the finish line by 1.153 seconds. In addition to his series-high eight wins in NASCAR’s top series, the 2014 Cup Series champion has four NASCAR Camping World Truck Series wins at Phoenix and one in the NASCAR Xfinity Series. His Truck Series wins came in 2002, 2003, 2008 and 2009. His lone Xfinity win came in 2006. A win this weekend would continue the No. 4 team’s blistering start to the season. It currently sits atop the point standings with a three-point advantage over Joey Logano after its back-to-back wins, its 395 laps led and 13 playoff points accumulated for race and stage wins through the first three races. Kyle Busch and Martin Truex Jr. talked on pit road after Las Vegas about how you looked like you did in 2014, and Truex said, “There goes Kevin Harvick off in his own ZIP code again.” Does it really feel that way, or has so much changed in that time, is it difficult to compare? Does your car feel that much better than it did near the end of last year? You just scored your 100th win in NASCAR’s top three series and your next Cup Series win will be your 40th, tying you with Mark Martin for 18th on the all-time list. What do those accomplishments mean to you?